Many people get very nervous when they have to move a computer or connect a device to a computer because the back panel of a computer looks like a tangled mess of cables and wires. 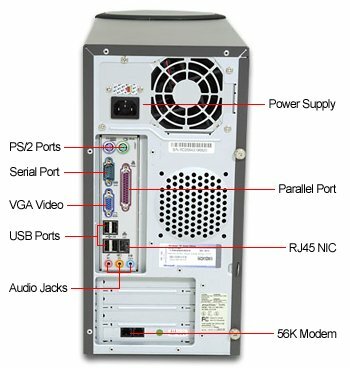 One of the problems is that so many new port standards, like digital video (DVI) and digital audio (S/PDIF) have been developed in recent years, and computer manufacturers want to support those new standards, while still allowing you to use your legacy peripherals, like a PS/2 keyboard and PS/2 mouse. The computer's the back panel may appear to be a tangled mess, but the connectors on the back panel actually conform to a standard layout. The current standard is called the "ATX form factor". Looking at the back of your computer, you can see that it's divided into three sections. The power supply is at the top, the I/O port connectors are in the middle, and the expansion board slots are at the bottom. Let's assume that you have some device, maybe a camera, a scanner, a printer, or even a network cable, that you want to connect to a computer. It's rare that a device plugs directly into a port on a computer, you usually need to connect a device to a computer through a cable. That cable needs to have a specific connector on one end to plug into the device, and a specific connector on the other end to plug into the proper port on the computer. Yes, it is possible to blow up the computer and/or the device if you don't plug a cable with the correct connector into a port. If the connector on the cable is smaller than the port connector on the computer and you manage to shove it in, you may blow something up. If you have to use force to shove the connector into the port on the computer, you may blow something up. However, you'll find that all connectors are polarized, which means they have a specific size and shape or have a polarity key that prevents you from plugging in the wrong connector, or plugging the connector in the wrong way. So all you have to do is study the connector at the end of the cable, and find a port on the computer that has a connector that is the same size and shape with a mating pin pattern. If the connector at the end of the cable has the same size and shape and a key does not prevent you from plugging it in, and you get a nice comfortable feeling like your not smashing pins when you plug it in, then you can feel secure that nothing will blow up. The device may not work, the computer may ignore the device that you plugged in, but nothing will blow up. With today's plug-and-play architecture, the odds are very good that your device will work immediately after you plug it in. If it doesn't work immediately, you may be required to install a driver, from a CD that came with the device, or download a driver from the internet. A driver is a small piece of software that allows hardware to talk to the operating system.